Convergytics – ANALYZE!! SOCIALIZE!! MONETIZE!! Business needs from Analytics have evolved over the last few decades. What started off as an attempt to understand “What happened in my business?” has changed to “What will happen in my business” and now to “What should I do to achieve my predicted goals?” Somehow, Analytics service providers are still concentrating all their efforts on the first two questions. This has created a gap between Business needs and analytical solutions and the gap is widening. Convergytics was set up in May 2012 to address this gap. At Convergytics, the solutions are provided keeping in mind the business needs and urgency. We strongly believe that what client needs is a business solution rather than a mathematical one. Our motto is ANALYZE!!SOCIALIZE!!MONETIZE!! 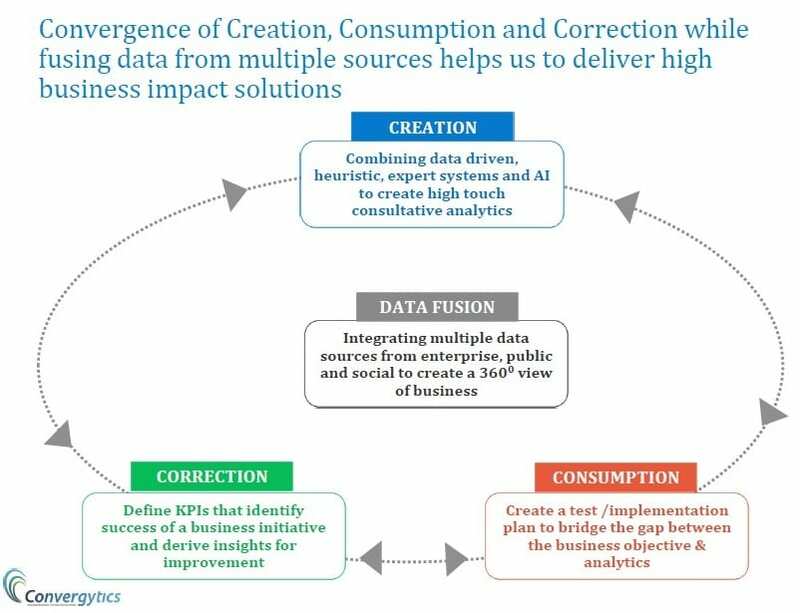 The Convergytics Logos with the three crescents (C’s) refers to these three important pillars of an analytics cycle – the Creation of analytics (Analysis), the Consumption of analytics (Socialization and Implementation) and the Correction (Monetization and feedback loop). The three Cs are built around the foundation of Data Fusion as no single source of data provides the holistic picture of the customer. We fuse data from different sources at each instance in order to maximize the learnings and make the solutions closer to actual consumer behavior. Convergytics has been working with some of the leaders in various industries like Media, Telecom, Retail, and CPG. The fact that many of these clients were already working with other vendors and have shifted to Convergytics is a sign that our proposition is well accepted by the clients. In the last 9 months, Convergytics has grown revenue by 176% and have grown in team size by 100%. The number of logos we service today are already in double digits and growing. Our approach is not to treat Analytics like a Math Factory. We provide solutions that are implementable. The first question we ask a client even before signing the deal is “How will they use the solution”? There are multiple situations where clients do not have an answer to the question. So we either work with them or lay the implementation roadmap and then do the analytical solution or we look at other problems that can be solved as well as implemented. This does mean that we may lose certain revenue, but we want to be known as ROI Focused Analytics Company. Sanjeev is the co-founder and CEO of the company. He has been involved in building analytics capabilities and garnering new accounts in Convergytics. His diverse understanding of analytical methods as well as his strong business sensibility helps clients consume analytical solutions. His role in Convergytics involves interacting with clients to understand the business requirements and translate them to analytical problem. He has also been instrumental in initiating Marketing management/ planning model and then converting the solution into a web based simulator to enable the consumption of marketing mix models. The tool is an integral part of the Media planning process for some of the leading CPG players. As a Co-founder, Director and VP Solutions Delivery, Santosh is responsible for sales & account management, value add to clients through focused analytics solutions including services and products, pre-sales and business development. Santosh, in his past-lives, has managed large retail accounts to provide end to end and cross functional analytical services and partnered with the account manager to plan and sustain account growth across their retail function including CRM/Marketing, Merchandising, Store Ops, Planning & Strategy. Santosh has also spent considerable amount of his time in retail consulting during his stint with Infosys. Randhir is Co-founder, Director and VP of Delivery and Product Development. He is a Digital Marketing, Web & Social Media Analytics Consultant with rich experience of delivering superior solutions to complex business problems. Randhir is a technology enthusiast with a track-record of combining strong domain knowledge with rich technical skills to deliver unique solutions that address business needs. He has rich experience in building scalable solutions in a range of technologies. At Convergytics, he manages delivery for key accounts and has productized and taken to market several of its cutting-edge solutions.